It was Paul Valery who wrote “a poem is never finished only abandoned” except of course that he didn’t write that at all, for the very good reason he was French and he also liked to write things longer and more flowerily. * But Auden said that he said it, and agreed with him that it was right, and put it in the forward of his Collected Shorter Poems in 1966 and helped make it famous. Picasso said the same thing about painting, possibly quoting Valery or possibly Leonardo de Vinci, who might have said it in the first place. As I was fussing about her portrait and fiddling with it and wondering whether to stop, my daughter quoted it to me, though she couldn’t remember where it came from, which as it turns out was hardly surprising. So I think, if not finished, it is abandoned, at least for the moment – and that is something of a relief to both of us. She was getting fed up with my staring at her whenever she adopted this pose, which is quite a lot of the time. Sophia is a writer, her Romanitas trilogy is published by Gollanz and Mars Evacuees will be published by Egmont in February – read it; it is brilliant. Whereas many people when they write, including me, are in a hurry to get down words, and then spend ages changing them, she writes slowly and spends more time looking at the screen of her laptop than actually tapping away at the keys. When she is thinking, she nearly always has her hand to her chin; she didn’t know that until I painted her. She also found it a bit disconcerting to find me staring at bits of her – “you wouldn’t like it either,” she said and demonstrated. She was right I didn’t. All the same, now that I have stopped, she says she likes the painting. I am relieved to stop because it had come to the point where I cannot change the things that I feel are wrong without basically starting again. That is the best reason I can think of to call it finished or abandoned. 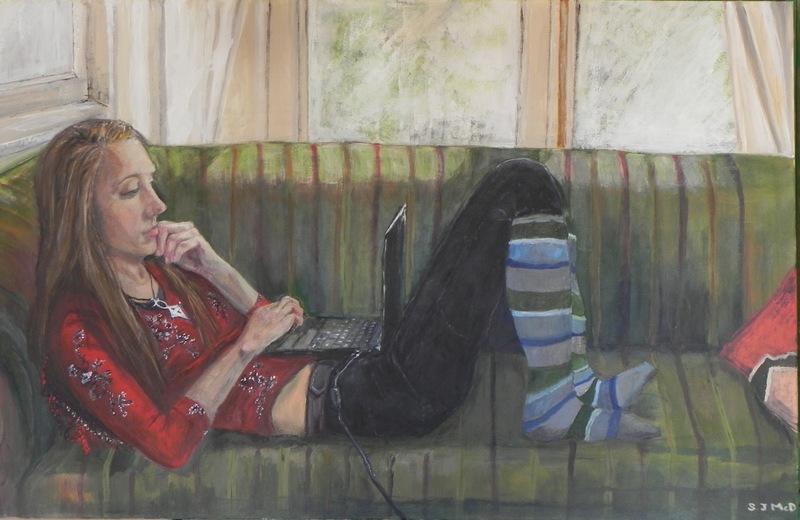 What I like about this painting is that it undoubtedly looks like my daughter; it is a most characteristic pose. I think I have captured the concentration that she shows when writing. I also rather like the way that whilst a woman lying on a couch has been depicted by artists across the centuries, she is clearly a modern woman and lying in a quite unclassical way. I am not going to tell you what I don’t like about it: who knows, you might not notice the faults. 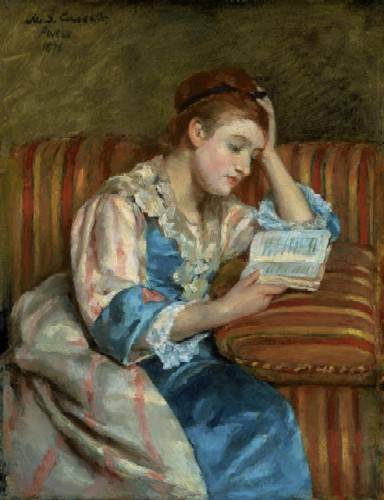 As a result of the work, I have also got to know this painting by Mary Cassat; Mrs Duffee reading on a striped sofa. My painting was not inspired by it; I found it after I had started, when I did an internet search on paintings of striped sofas as I wanted to see how other artists had handled stripes. The answer is you get on and paint them. It is interesting that she, like me, was interested in the different stripes; she has Mrs Duffee sitting in a delicately striped dress; whereas I have Sophia in her striped socks. Her painting was done in 1876 and it is quite possible that our sofa dates from the same time; it was bought by my mother-in-law at an auction back in the early 1950s but it was already old by then. Certainly there are similarities. It is interesting to look at it and to think of the different people who must have sat on it. If both it and the painting survive another hundred years or so, will the clothes my daughter is wearing look as alien to their time as Mrs Dufee’s do to ours? Will the cord on her laptop seem as old technology as the sight of Mrs Duffee struggling to read by lamp, or even candlelight, seem to us? *Un poème n’est jamais achevé — c’est toujours un accident qui le termine, c’est-à-dire qui le donne au public. Ce sont la lassitude, la demande de l’éditeur,— la poussée d’un autre poème. Lovely piece and wonderful post!